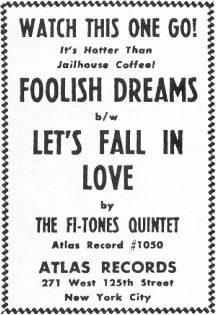 "Foolish Dreams"/"Let's Fall In Love"
Inducted Into The UGHA Hall Of Fame on June 8, 2002! Above: Photo of The Fi-Tones, who were from Brooklyn, NY. 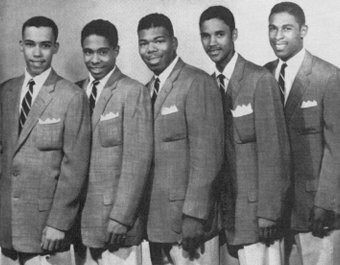 Members were Marlowe "Lowe" Murray (tenor), Cecil Holmes (tenor/baritone), Ron Anderson (bass), Lloyd Davis (baritone/guitar), and Gene Redd Jr. (tenor/piano). For a short article about The Fi-Tones by J.C. Marion, please click HERE. Above: (Left) Label image for Atlas 1050 released September 1955; (Right) Atlas ad from October 1955. Lloyd Davis is the lead singer on this side. The flip is "Let's Fall In Love" with Gene Redd Jr. on lead and Ron Anderson singing the bridge. 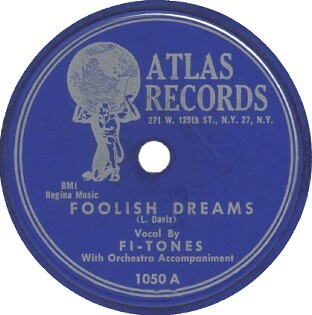 This was The Fi-Tones first record although, as The Caverliers (with some member changes), they were on two previous Atlas releases. A) Click on an option below to listen to The Fi-Tones using Streaming RealAudio.